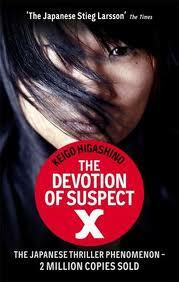 The Devotion of Suspect X – a Book review…. First things first, the Japanese names sounded similar and took me few minutes to get them right to the story. Once I was familiar with the characters then sailed pretty fast. The author Keigo Higashino makes an excellent portrayal of human sensibilities and frailities without much of the fanfare that we get to see in these kind of books. You already know you are reading a movie script when the story is fastpaced, has a lot of twist and turns and the protogonist is painstakingly methodical. Add to it he is a mathematician will only make it more intense, he has a way he lives on or is immensely calculative for his own worth. A tragedy by pure circumstances forces the mother Hanoka and daughter Misato to take Ishigami’s ( the mathematician) help after a simple tiff between the now divorced husband and wife turns nasty with the man attacking the daughter, the brawl gets physical and takes a nasty turn with the man’s death and then the story unfolds. Our mathematician and the hero who has a logical and intuitive mind extends his help to cover up the event and most importantly create alibi as much as possible so that the mother and the child are always out of the police radar. A classic case here of making the police think of what they see and what they might not really want! A very rare turn of events which is statistically close to zero makes it a story to read. Possibly the mathematician Ishigami would not have thought that the detective in question could have been an alumni of his university or that the detective was good friends with his former college mate. Now the police could have their way and Ishigami almost calculates as much to get close to their thinking and makes the plot fittingly look believable and trace it to the dead end as he might want to and he almost comes close to leading the police to his end. But there are things which go wrong, probably he takes things for granted or putting it mildly some variables he is not able to control. The arrival of his erstwhile college friend Yukawa and the friendship of the detective and the professor of physics takes us through the minds and machinations if I may call it. Just as he keeps rolling out plans perfectly there comes a time when his friend comes across to read his mind. Its no more mathematics alone that makes him do it, under the motivation lies the most innocent and important life saving factor of the smiles of two women known only to his heart. The author also plays the poverty card very well in a sense how the poor are just statistics and how even a professor could use them to his advantage so much so that they will never be cared in a society so much full of contradictions inside out. Could that be author is trying to show the mirror to the world outside in this case how the life lost doesn’t count at all because its nowhere in the picture till someone decides to look into suspect’s mind. Loved the characterisation like I mentioned the few characters symbolises the society in action and how people are generally simple and with inborn traits. I am going with the author on all the way he wanted to be saving the two un-intentional killers but the way it ended put me off to be frank. That little girl Misato deserved much better than the burden of having to live with something that happened because she was a girl. Somewhere it looked like the women are same all over, giving in to the reckless behaviour of the men that they care and love with all their heart and only to be betrayed and then there is the way destiny is supposed to behave irresponsibly, just when she thinks all are fine with her, comes the biggest shock for her life. Yes, alongside it reminded me of my classes in physics and yes like the professor says physicists have a way with life and its not easy getting over them. It is always good to have physicists around, except when you have actually murder someone to create an alibi for already killed person. In this case it wasnt reasoning because love is beyond that and when you are in love you will do whatever it takes to prove yourself. A good fast paced read and you cant live without maths and physics, though you might detest the fact that you are not going to use them but even a car race driver ( being Indian F1 fan I needed to add this) would need to know how to extract maximum from his car, well Ishigami did give this answer in one of his classes.